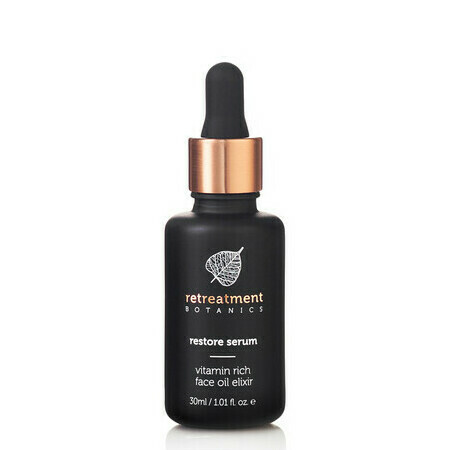 This Retreatment Botanics Restore Serum is a potent, superfood facial oil packed with antioxidants, Omega 3 & 9 essential fatty acids, and vitamins, including Pro-vitamin A (beta-carotene), Vitamin C and Vitamin E, thanks to natural and organic ingredients such as Amazonian Buriti Fruit, native Sandalwood Seed, wild Rosella Flower and Kakadu Plum Seed Oils. Ideal for normal to dry/dehydrated and mature complexions, it is formulated to penetrate deep into the skin for a luminous look without a greasy feel. Especially suitable for those seeking to minimise fine lines and wrinkles, improve the skin's elasticity and combat other signs of ageing, it is designed to leave skin feeling super-soft and with a vibrant, radiant glow. 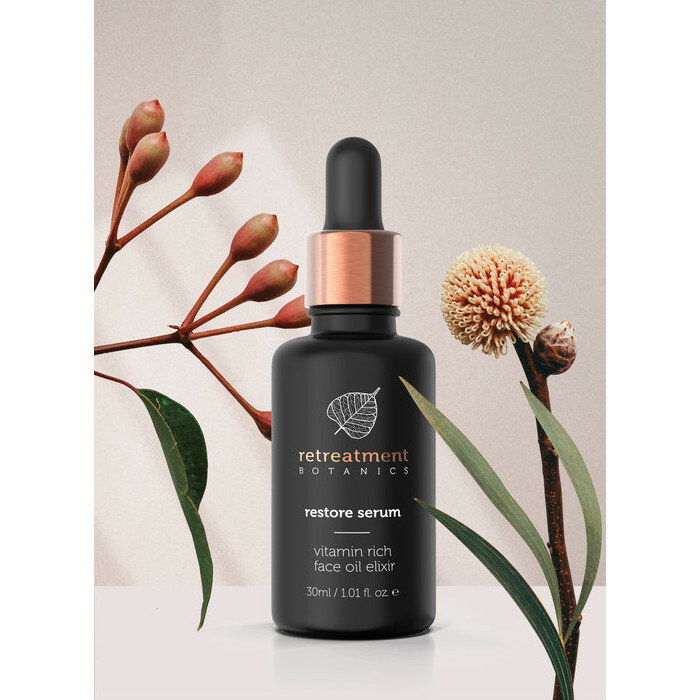 Retreatment Botanics is the dream-child of Olivia Newton-John and is the advanced formula skincare range enjoyed by guests at her highly acclaimed, multi-award winning Gaia Retreat & Spa in Byron Bay, Australia. Created by top natural skincare scientists, the potent benefits of Australian native extracts are found in every product thanks to the use of Cellular Extraction™ technology and Cellular Biomimicry™. Retreatment Botanics proudly supports the ONJ Cancer Wellness & Research Centre, which conducts world-leading research into cancer and provides education, treatment and holistic support for individuals with and families affected by cancer. Australian made and owned. Certified by the Orangutan Alliance (Palm Oil-Free). Certified Cruelty-free and Vegan. Argan oil, Avocado Oil, Camellia oil, Chia Seeds, Jojoba Oil, Kakadu Plum, Lavender, Macadamia Oil, Rose, Rosehip Oil, Sandalwood, Sea Buckthorn, Vitamin E.
Step 1: First, cleanse skin with your favourite Retreatment Botanics cleanser. 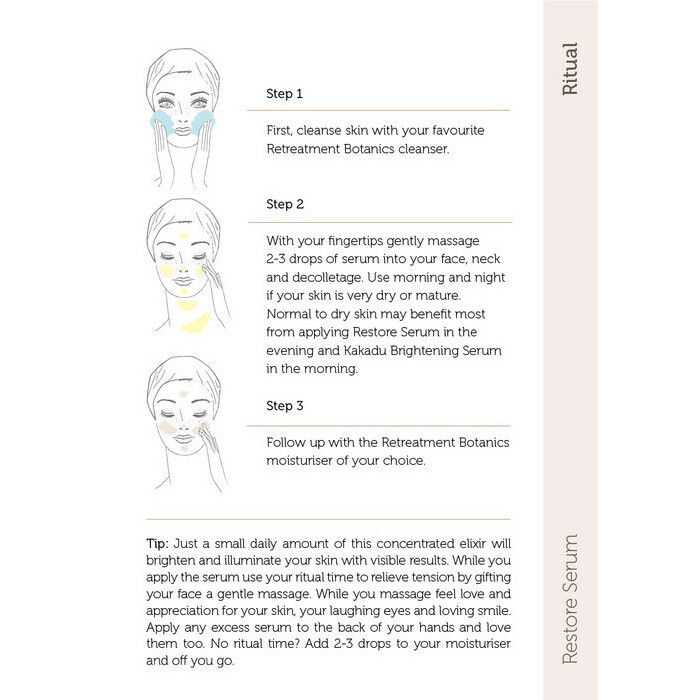 Step 2: Gently massage 2-3 drops of serum into your face, neck and décolletage using your fingertips. For very dry or mature skin, Restore Serum may be used morning and night. Normal-to-dry skin types may only need to use once in the evening, and can also benefit from using Kakadu Brightening Serum in the a.m. 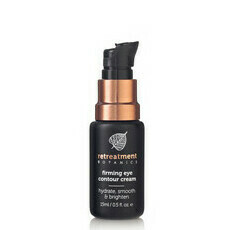 Step 3: Follow up with the Retreatment Botanics moisturiser of your choice. Tip: Use this facial elixir daily to brighten and illuminate your skin. It is very concentrated, so you only need a small amount to see visible results. You can even add 2-3 drops to your moisturiser to save time in the morning. While dabbing the serum into your skin, you may use this time to relieve tension with a gentle facial massage. Use small, upward circular motions and feel your stress melt away during this calming ritual. 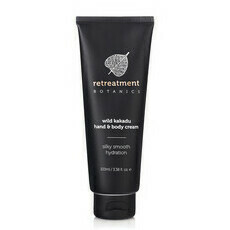 Massage any excess serum into the back of hands for added hydration. Beautuful serum. Hydrating and soothing. 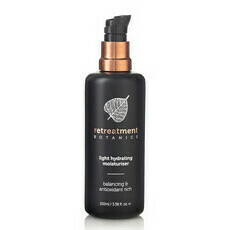 Love using this serum at night before bed - super hydrating and not heavy. The scent is delicious & soothing. I wake up with my face feeling plump & vibrant!!!! Highly recommend trying this! This serum feels like pure goodness on my skin. It has restored a supple, youthful look to my mature complexion. Love the smell. Absolutely divine.